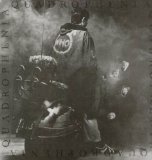 Quadrophenia is ranked 2nd best out of 42 albums by The Who on BestEverAlbums.com. The best album by The Who is Who's Next which is ranked number 28 in the list of all-time albums with a total rank score of 58,312. Members who like this album also like: The Dark Side Of The Moon by Pink Floyd, Who's Next by The Who and Wish You Were Here by Pink Floyd. Related links: top tracks by The Whotop tracks of the 1970s, top tracks of 1973. Showing latest 5 ratings for this album. | Show all 1,073 ratings for this album. I prefer this album over Who's Next and Tommy. Excellent album and a more consistent and varied album to their previous rock opera. Everything here - the singing, the drums, the bass, the guitar, the lyrics, and the music itself can easily contend with anything written in popular music, ever. This album is absurdly underrated, and the fact that it is only 120th overall on this site is a rather large grass stain on the metaphorical blue jean that this site is. Amzing double album, almost as good as Tommy and Who´s Next, and for a time my favorite album from The Who. One of my favorites double albums ever.